Amy Einhorn Books/Putnam, 9780399157523, 368pp. "A Crime in the Neighborhood, " told with the deadpan humor of Nick Hornby-a wonderful novel about a boy genius whose brother may, or may not, be a murderer. It's 1967. Jack Witcher is a twelve-year-old boy genius living in a Virginia suburb at an address the entire neighborhood avoids. Jack's father has lost his job-again-and he's starting fights with other fathers. Jack's mother, sweet but painfully ugly, works as a cashier at a local market. Jack's older brother is a long-haired, pot-smoking hippie. If all of that isn't bad enough, Jack's brother suddenly becomes the main suspect in the disappearance of the town's golden boy. And to make matters even worse, Jack is in love with the missing boy's sister, Myra. Mr. Gladstein, the town jeweler and solitary Jew, is Jack's only friend; together, they scheme to win Jack Myra's love. But to do that, Jack must overcome the prejudices, both the town's and his own, about himself and his family. Stephen Wetta is a native of Richmond, Virginia. He received his Bachelor's Degree from VCU and received Ph. D. at New York University. Stephen is currently an English professor at Hunter College. 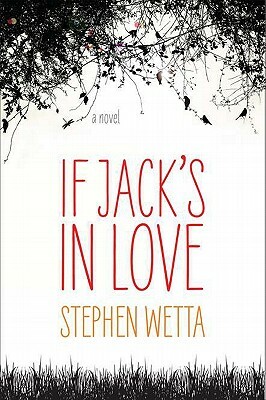 "If Jack s in Love" is his first novel." "Wetta's debut portrays the fictional El Dorado Hills in Virginia during the late 1960s with Southern gothic flair. ... At turns unsparing, tender, and disturbing when it comes to rivalry and the nuances of love versus obligation, this is no typical bildungsroman. That Jack emerges from a crucible determined never to look back is unsurprising; it is the path leading him to this conclusion that is intelligently, wonderfully conceived." "If Jack's in Love is a moving portrait of a specific time, family and town, but also a universal story of growing up and coming to terms with the people-and places-that raise us, told with all the humor, truth and urgency of its teenage hero. It may have taken the first half of his life to write, but Wetta's touching novel was well worth the wait." "...[Y]ou should read this wonderfully written marvel of a book: a work both gripping and hilarious, joyous and heartbreakingly bittersweet." "The language here is wonderful. . . . downright funny." ". . . terrific . . . raw and complicated . . . keeps us gripped until the end."